Click HERE to open a new window with an enlargement. Kim is an award winning quiltmaker from Australia who features imaginative use of Kaffe's fabrics in her quilts. 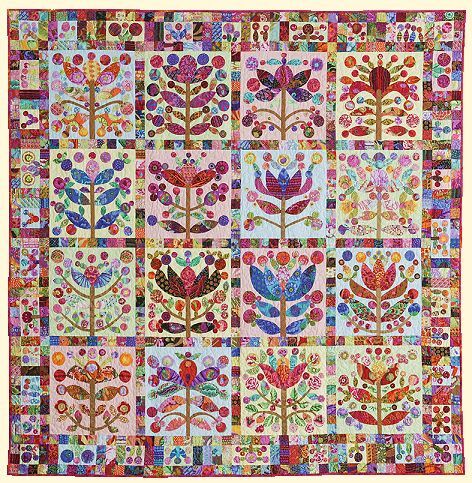 We have been huge fans of her work for sometime and are so pleased that Glorious Color is able introduce this, the first of Kim's glorious applique patterns, to you. The Starter Fabric Pack: The original quilt has many fabrics that are long discontinued, so we included as many of the original fabrics as we could and, with Kim's guidance, augmented them with new Kaffe fabrics. We have bundled quarter yard pieces of Kaffe's fabric in enough variety to do most of the applique and sashing. Kim used many more fabrics, especially using scraps in the sashing. We encourage you to add your scraps to our fabric pack to add to the variety. The fabric pack does not include the background fabrics or pattern. The Background Fabrics: The original background fabrics for the blocks and the borders are pale pastels and off white neutrals. Alternatively, we suggest using Kaffe's Spots or Aboriginal Dots fabrics for the background. Choose one or many. The complete background requires a minimum of six yards. Note that because each block is made from a 21 x 21 inch square, you can make one or two blocks from a minimum of 3/4 yards of fabric. The pattern is 1:1 scale, so no enlargement is required. The finished quilt measures 94" x 94"
The fabric pack includes enough fabric, some of which is shown in the picture, for the applique and sashing squares. It does not include the background fabric or the paper pattern. The original Lollypop Trees quilt had many more fabrics and we encourage you to use lots of scraps from your stash to make the quilt uniquely yours. In the pack is more than 15 yards total of an assortment of long quarters and 3/4 yd for the tree trunk fabric.